Over the past two years I've had the privilege of getting to know Eliza Clark and Tim Trojian, co-owners of Foxfire Mountain House in Mt. Tremper, New York. Our friendship started as many of mine do these days. I discovered Foxfire on Instagram and after a few weeks I worked up the courage to reach out to Eliza, confess my admiration of Foxfire and ask if she might be interested in working together. Eliza responded just a few minutes later with an enthusiastic "Yes!" and the rest is history as they say! Eliza and Tim discovered the Foxfire property, complete with the original 11-room Inn, in 2013. The renovations were extensive but Tim and Eliza dug right in, learning as they went - laying hundreds of tiles themselves, pouring the concrete bar and more - all to achieve their dream of working together on something that they truly loved. As we put the final touches on our 2nd annual creative retreat, "The Art of Living Well", I asked Eliza (who is also an accomplished author, television producer and interior designer) to share a bit on what exactly helps to make Foxfire Mountain House so very special. The style at Foxfire is both perfectly on trend and yet perfectly timeless. That's certainly not an easy thing to achieve! How do you do it? For those of us who know you and your husband, Tim, Foxfire really is a perfect reflection of you. How do you translate your personal aesthetic into design? The main thing is that I love antiques and vintage. When I worked as a television producer, I worked on American Pickers and the Canadian version, not surprisingly called, Canadian Pickers. My favorite past time is scouring antique stores and consignment shops. It's a big part of my life and it's given Foxfire, and our new property La Colina, their look. It just wouldn't be my thing to have an all new room. A mix of old and new can work really well, though - old dressers, for example, are a challenge because the drawers often don't close properly and they can smell musty and transfer that to your clothes. So I like new dressers or I get very particular with any old ones I buy. And I love beeswax candles. When night falls, I like a glass of wine and candlelight. I transfer that to Foxfire for sure. So many of the things at Foxfire are either handcrafted, vintage or thrifted. Why is this important to you and how does it help develop the overall feel of Foxfire? For sure. I like an item to have weight and patina and a sense of history to it. I like unique (though not "whimsical", lol). I don't want anything of mine to look like everybody else's and I'm often customizing pieces of furniture in some way. Making an old lamp base into a hanging light or painting a chair a different color. That kind of thing. I really love beautiful handmade pieces for the same reason. They are authentic and have a soul. Energy went into making them and that energy continues to have a beautiful vibration coming out of them. (Can you tell we live close to Woodstock??) But it's true. In the end, I guess that's what personal style is. You make design choices based on some instinct or deep memory of something you feel is just "right." Foxfire is so much more than just an inn - from the bar room to the glass house, it's all a bit of an experience. What elements tie it all together so cohesively? That's the best. It should be a sensual experience to be fully encompassing and memorable. It should look, smell, sound and feel good. What's the fifth sense? Taste. I've never licked the coffee table, hehe, but the restaurant food is good, I can vouch for that. When you're visiting Foxfire there is such a great feeling of being at home here. Why do you feel that it's so important to make your guests feel so perfectly at ease in the space that you have created? Nobody wants the old standard hotel room vibe anymore that's bland and neutral, and usually uncomfortable with furniture that was meant to last forever but was never once comfortable. Airbnb and other home rental sites really changed the way people want to travel and influenced the new boutique hotel movement. While a homey feel is the perfect setting, a lot of guests don't actually want to be in someone else's home with strange clothes in the closet and stuff stored under the bed, used food and condiments in the fridge. They still want to be taken care of and have the true getaway feeling of being pampered, where everything is fresh just for them. At Foxfire, you can make a fire and play records and generally make yourself at home, but you'll be served a yummy breakfast in the morning and you don't have to clean up after yourselves before you leave. You can fully relax and that's important to us since it's what hospitality is all about. What's the best thing that you've learned from your years of hosting about helping strangers connect in a real way to this place? We've really enjoyed the "salon" experience that our guests get during their stay. We're constantly seeing people connecting at the bar or in the lounge, sharing stories and then exchanging contact info. Lasting friendships are made. I think it starts simply because each guest has specifically chosen to come to Foxfire and so they already have that in common. They're already united in looking for something similar to enjoy in those very precious periods of downtime they have. It's a meeting ground. There are a lot of like-minded creatives and adventurers who find their way here. You and Tim have become seasoned hosts. What's your favorite part about welcoming guests to Foxfire? 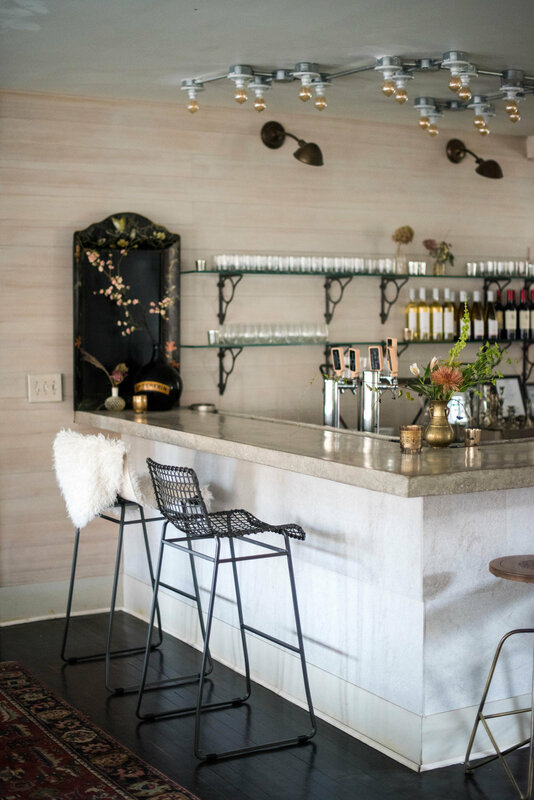 First impressions are really important and so I like to see our guests come into the inn and look around, taking it all in: the glowing candles, fire burning in the hearth, fresh flowers in every room, and a bartender behind the bar ready to make their drink of choice. It's a perceptible shift to relaxation you can see in their expressions and that's my favorite part. The word that I hear the most often with Foxfire is "magical". What is it about this place that you think makes everyone feel this way? It's true. We hear that word ALL that time and we love it. I'm not completely sure what it is that makes people feel that way. Perhaps a combo of everything. People also talk about the vibe and the good energy in the place - I think all three terms are kind of the same thing they're describing. I'm not sure where it comes from but I'm happy for it! What's next for Foxfire? And tell me a little bit about the new property, La Colina. We're excited to be publishing a book of design tips and recipes coming out in Fall 2019. La Colina, Foxfire's new sister property, is a dream. A gorgeous 1930's Spanish-style estate set at the top of a hill with mountain vistas. We're renovating four cabana rooms that have lovely old plaster walls and fireplaces, and making over the kitchen in the main house. We're opening in June so we're kind of obsessed with it at the moment. Can't wait for everyone to see it! I hope that you will consider joining us at Foxfire Mountain House along with my friend Nicole Cole of Vestige Home for what will surely be four incredible days of creativity, relaxation and discovery for "The Art of Living Well." There are only three days left to register so don't miss out! All of the details can be found here along with a bit more about Foxfire, The Forest Fern and Vestige Home. I would like to offer a huge thank you to Eliza Clark and Tim Trojian for all of your support, encouragement and friendship over the past two years. Whoa, this week was a doozy on this end. With the majority of our household sick with the flu, another ice storm, and my sweet niece in the hospital in Pittsburgh we've just been keeping our heads above water. A few days in bed meant that I had some extra time to dig into a few new obsessions - here's what I'm loving this week. I can't wait to make a trip to Philadelphia to take this class with local artist Carla Weeks. I've been a big fan of Carla's work for some time ever since I saw her beautiful wallpaper from Anthropologie in my friend Nicole Cole's bathroom makeover. From her gorgeous pillows to her large scale murals, Carla's work speaks to me with her tone-on-tone minimal aesthetic. I've haven't done any printing myself since way back in my high school days so I'm excited to learn from Carla. The cozy Bar Room at Foxfire Mountain House has to be one of my favorite places. From the artisan cocktails to the vintage indigos casually draped on the chairs, every meal feels so very special. I can't wait to learn from the Foxfire chef's during our private cooking class at our retreat in March. Our 2017 guests shared that the bountiful meals with Nordic country influence, thoughtfully prepared by Foxfire helped them to feel cherished during their stay so we knew that we absolutely wanted to include a cooking experience for this year's retreat. I might be in the minority hear but I think I'm over glass shower surrounds. 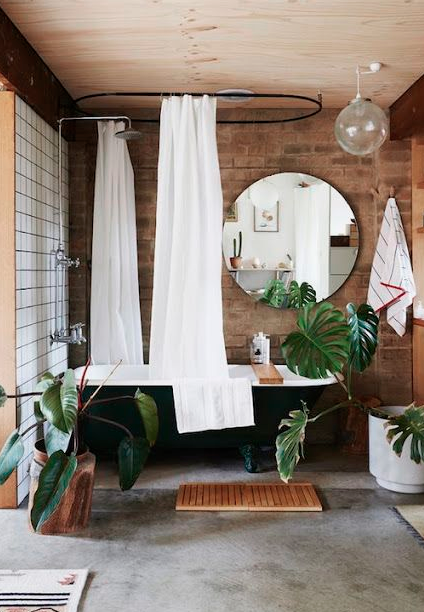 Yes, they are bright, minimal and really open up a space but I love the privacy and coziness of a shower curtain. I'm loving ceiling mounted shower curtains like the ones below. We will be trying this in our bathroom remodel since we decided that shower glass wasn't for us (not to mention the over $2k price tag for a 36"x36" shower). I'm thinking a mossy green linen curtain mounted high would be a perfect addition. I ordered this book for my mom for Christmas last year and this week I broke down an purchased another copy for myself. Is there anything better than dreaming of a garden bursting with flowers while stuck inside in the dead of winter? Filled with so much useful knowledge and inspiring photography, "Cut Flower Garden" is a must-have for your favorite gardener. Admittedly, some of the flowers are far too labor intensive for my own taste (you have to know your limits right?!) I will absolutely be adding Hellebores, Peonies, Bells of Ireland and more to my garden this year. What are you loving this week? I'd love to hear from you! This may come as a bit of a surprise but when I first started teaching Macrame and Weaving workshops, I really didn’t love teaching. I would worry about ALL of the things. Would anyone sign up for this class? Are my pattern samples okay? What if I forget to pack any scissors?! They would become frustrated that they couldn’t perfectly tie a knot or remember how to do a certain weave. It wasn’t fun for them and I left the classes feeling completely exhausted when I wanted to feel inspired. Despite all of this I wanted to continue teaching. I needed to find a solution, and quickly. I tried changing my patterns for the classes. No luck. Maybe I needed to offer different kinds of materials? Nope, that didn’t help either. Was it my workbooks? The venue? The music even? Wrong. Wrong. Wrong. Then it finally hit me. I was sucking the fun out of my classes, and creating stress for myself and my students, by removing the CREATIVITY from my classes. I wanted my workshops to be a place where my students could tap into their personal creativity, without constant comparison to me or to the person next to them. I wanted to talk about all of the things that are the most fun about making this kind of art - composition, texture, layering, expression, style. So, I stopped teaching to a pattern. Yes, I have samples for each class but instead of bringing one pattern, I bring many samples that use the same tools and materials that I provide to my students. Each of these samples is then executed in a different style. We spend a lot of time in my classes talking about how we can go about creating a look that is personal and unique with the materials. For my larger classes I always bring an assistant teacher so that each student can have individual time to talk about how to bring her piece to life. I’m not exaggerating when I say that this COMPLETELY changed everything for me. I now find that the classes are usually very relaxed and each student is able to work at her own pace. If she is having trouble with one technique, we can focus on getting it right before forcing her to move on to the next part of the project. I love having the time to discuss each individual’s piece and teaching a new technique that would be perfect for her work. Most of all, I love seeing how each and every piece that comes out of the classes is 100% original. I hope that you will consider joining me at my upcoming retreat at Foxfire Mountain House for four magical days where we will immerse ourselves in craft. I'm pulling together all of my favorite tools, materials and resources this year and I absolutely can not wait to teach you - without a pattern of course. You can read all about our all-inclusive retreat here. If you are a teacher or considering teaching I hope that my honesty here might help you in your journey to becoming the best teacher that you can be. I'd love to hear from you if you have any questions or insights that might benefit our community. Studio Snapshot with Vestige Home: Making New Friends as a "Grown-Up"
Let's be honest for a moment - making new friends as a "grown-up" isn't always the easiest thing to do. Sure, we all of piles of new-age pen pals through our favorite apps but I'm talking about new friends IRL. A while back I realized that if I wanted to build new friendships then I would have to get past my insecurities, seek out inspiring women and then ask to meet. Yes, sometimes your DM goes unanswered but more often then not this is how I start to form real connections with some pretty awesome people. That's exactly how I met Nicole Cole. I started following Vestige Home in early 2017 and soon learned that she was located in Philadelphia, only about two hours from our home. When planning a visit to my sister in Philly I contacted Nicole, tried to sound as un-stalker-ish as possible, and asked if I could stop by her studio on my way home. I guess it worked because she agreed and we set a time. I loved Nicole right away. She is warm and welcoming, a feeling that continues in her studio space filled with collected treasures and beautiful carvings. Her attention to detail was unmistakable - the workshop was curated (yes, even her workshop) and reflected her unique point of view, something that is hard to find. From the soft pink door to the tiny hanging plants, I was smitten. A wall of collected leaves in Nicole's home workshop. A collection of Wee Forest Planters in Nicole's home. Nicole's home is as unique and lovely as she is (did you see her One Room Challenge reveal? Yeah, it even got a shout out from House Beautiful) from the tumbleweed chandelier to the inky craftsman trim. Nicole's designs are both stylish and comfortable, always with the most beautiful vintage finds and layers of texture. Just this week Nicole is featured on the Style Matters Podcast with Little Yellow Couch. The interview really captures Nicole's warm personality and gives you a bit of insight into her design perspective and influences. I knew that Nicole would be the perfect teacher to add to The Art of Living Well, the 2018 retreat hosted by Foxfire Mountain House. Nicole taught me how to carve, a skill that I cherish. There is really nothing like using a simple, beautiful object created by hand to move task to ritual. As a teacher, Nicole focuses on teaching skill and guiding creativity, allowing each student to create something completely unique. I learned to carve from Nicole. The walnut spoon above is the first piece I started in her studio. I hope that you will take some time to discover more of Nicole's design and carving work and we would absolutely love to have your join us for the all-inclusive retreat at Foxfire Mountain House from March 8th through 11th. We will gather over four days to exploring how creative practices and moment of thoughtful self-care can help lead the way to a life well lived, something that Nicole strives for in her own work and life. I can't wait to meet everyone this year and add a few more friends, IRL of course. After many months of plumbing, electrical, drywall, repairing and painting, it's finally time to get the tiling going in our guest bathroom remodel. I picked out this matte black porcelain hexagon tile for the floors from AllModern.com. Our home was built in 1947 so hexagon tile was an easy, classic choice. This gorgeous bath via Canadian House and Home was one of the inspiration images that I used when planning the space. So simple and gorgeous right?! My husband, Chris and I had done plenty of tile projects in the past so late last week we got the kids to be early and figured we would have the floor installed by midnight at the latest. With the tile saw at the ready we mixed up our thin-set and then... we quickly realized we had NO IDEA how to cut this stuff. We found a few online tutorials like this one from Young House Love for how to cut penny tile that helped get us started and after a bunch of researching, and some trial and error, we landed on a method that worked really well for us. 1. Tape the tile to a piece of cardboard (we used the pieces that were shipped with our tile) on the line that you will be cutting. The tape gives you a guide, helps to hold the tile in place while scoring and prevents tile breakage when nipping each tile. 2. Using the ceramic tile cutter, score each tile along the tape line. You aren't cutting the tile here but rather just setting a line to help encourage a clean break when you use the nippers. 3. Place your nippers on the scored line in the middle of the tile and slowly apply pressure until you break the tile on the line. 4. Save all of those cut halves that don't break! You will have some pieces that still shatter despite your best efforts. You can simply pick those pieces off of the mesh and replace them with your stash of cut pieces. 5. Start laying out your tile. We dry fit all of our tiles before we started to set them. Yes, this was time consuming but it really saved us a lot of headaches during the installation process since all of our tiles were already cut and labeled. 6. Speaking of labeling, use some painters tape to label each sheet of tile so that you know where they go when it's time to install. We printed out a photo of the floor and made a little directional map to help remind us of the pattern. And that's about it! I actually really liked cutting the tiles this way - it was far less messy than working with a wet saw and a lot quieter too - perfect for those of us who do projects while the kids (and neighbors) are sleeping. I hope that something here might help you with your next tile project. We can almost see the light at the end of the tunnel with the guest bath. On to wall tiles! Hello friends, it's been a while! Admittedly, the blog has been much neglected this year. When it's May and your last post is about Holiday baking (eek! ), you know that it's time to jump back in. I'm feeling inspired and this year I'm hoping to bring you even more content including sharing my passion for interiors, more highlights of local gems like my favorite shops and interviews with amazing makers and artists. I'm excited to share the plans for first big remodel in our current home - our guest bath. When we moved into our 1947 ranch about two years ago we knew that this would be one of the first really big projects that we would have to tackle. There was pretty obvious water damage in this room - so much so that our plumber recommended that we not use the old shower at all - so up until now, this bath has served as a powder room. The before's are too bad aesthetically, but all of the damage was lurking underneath piles and piles of plaster, wire mesh, bad vinyl flooring and tile. You can see that the shower was already partially demolished when I took these since we had attempted to retile the shower about a year ago only to find that THERE WERE NO STUDS IN THE WALLS since they had been eaten away from extreme water damage. So yeah, we put that project on the back burner, covered the shower with plastic to keep out kids and guests and affectionately dubbed this "The Murder Shower". Cute, right? But, before we get to the construction breakdown, let's look at all of the pretty stuff. I wanted the space to be modern and little bit traditional with a slight midcentury vibe. This bathroom from Design Sponge served as the primary inspiration for the space. I love the simplicity of the classic black and white tile as well as the thoughtful mix of materials and accessories. Our home is a strange mix of a formal Pennsylvania stone ranch and a California Modern ranch so after much searching and Pinning, this felt like the right direction. As my husband Chris worked on the demo, I put together a mood board for the space to clarify my ideas and give us a good starting point. I've become a big, big fan of developing mood boards. It saves me a ton of time and helps to keep us and our team on point - even our contractors. I make all of my boards in Keynote and then export them to a PDF that we hang on the wall for reference. Since we don't have room for a pretty clawfoot tub like the inspiration room, the Kohler Brockway Sink was my first choice for the space. I knew I loved these sinks since I had seen them at the incredible Foxfire Mountain House and the cast iron enamel is a timeless yet modern look. Bonus - this sink is a major space saver in our small footprint. We went with a porcelain matte black hexagon tile for the floor and a large format white subway tile for the walls. For the inside of the shower floor and the shower niche we are using this marble hexagon tile from Home Depot. The ceiling will be a faux shiplap and since we are keeping the original V-groove wall cabinets on either side of the window, the shiplap will be installed to mimic the lines of those cabinets. The more permanent fixtures in the space like the sink faucets, the shower fixtures and the shower door handles will all be in a warm stainless. 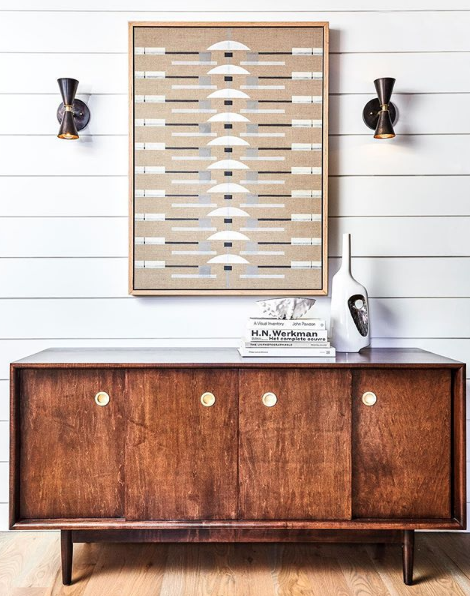 We are bringing in some mixed metals with this light fixture from Cedar and Moss as well as brass accessories and knobs (see source list below). We almost have all of the materials and fixtures ready and waiting for installation - yeah our garage is pretty full right now! In regards to the sourcing, I wanted to share a huge tip on saving both time and money with this kind of remodel. When you are finding and buying all of your materials yourself, something like this can easily become very overwhelming. I saved myself a ton of time and money by working with one supplier for the majority of our purchases - Build.com. I used the company's live chat feature and worked with one customer service representative for all of our purchases including the Kohler sink and faucets, the Delta Shower trim kit and valves, our Tile Redi shower pan, drain assembly, Kohler soap dish and the vent fan. Build.com beat any advertised price that I could find and also worked with me to get the very best price possible on their already low prices with free shipping and no tax. The whole process was a breeze and we saved hundreds of dollars. This is in no way sponsored, I just really love the service that they offer and wanted to pass along that tip! I have a few other fun projects for the bathroom in the works like custom artwork and that DIY shiplap ceiling that I'm excited to share with you as well as all of the construction details. In the meantime, here is the list of sources for the mood board. This week our tile board and drywall is going up and I'm pretty darn excited! It feels like we are inching towards actually finishing this thing! So many of you reached out to me for the recipe for this cake that I thought I would post the recipe here to share! It's a dense, spicy gingerbread with a tangy lemon-hinted cream cheese frosting that is simply perfect for the holidays. What I loved the most about this cake was that it was very simple to make, you don't even need a mixer for the cake portion. I made my cake layers and sugared cranberries the day before and assembled it all a few hours before our meal. I love recipes that allow me to be fully present during the holidays and keep the day stress-free. I hope that you love it as much as we did. Heat oven to 350°F. Use a nonstick spray to coat three 9-inch round cake pans and line the bottom of each with a fitted round of parchment paper. Bring stout and molasses to a boil in a large saucepan and remove from heat; whisk in baking soda carefully — it will foam up. Cool to room temperature. In a large bowl, whisk together sugars and oil. Whisk in eggs, then whisk in cooled stout-molasses mixture. Combine the dry ingredients in a separate bowl. Place dry ingredients in a fine-mesh sieve or sifter and shake over bowl. Stir until just combined. Divide batter into prepared cake pans. Bake for 18 to 22 minutes, until a toothpick inserted into the center of the cake comes out clean. Cool in pan on a cooling rack for 10 minutes, then flip out onto another sheet of parchment paper, carefully remove parchment paper from the bottom of the cake (it’s sticky) and flip back right side-up, letting each layer cool completely. If you are storing the cake layers for the following day, wrap each in parchment paper and then in cling wrap after it is completely cooled. Combine 1 cup of water and 1 cup of sugar in a medium saucepan and bring to a slow boil. Continue to boil for about 10 minutes until the syrup has thickened slightly. Remove from the heat and let cool for 5 minutes. Using a slotted spoon, place cranberries in the syrup to coat and then transfer them carefully to a cooling rack making sure that they do not touch. After about 1 hour, take the cranberries and roll them in the remaining sugar to coat. Let sit for another 1 hour at room temperature. If storing for the following day, place in an unsealed plastic bag in the refrigerator. In a stand mixer with the paddle attachment, cream the butter. Add the cream cheese and mix to combine. Add the vanilla. Add the powdered sugar 1/2 cup at a time with the mixer on low. Once all of the sugar is added, turn the mixer on medium-high and whip until thick and stiff - about 3-4 minutes. Finally, add the zest of one lemon and stir to combine. To assemble the cake, place a small amount of frosting in the center of a cake stand and place the first layer, bottom-side down on the stand. Cover the top of the cake in frosting with an offset palette knife. Add the second layer, top-side down and frost the top of the cake. Add the third layer, bottom-side down and frost the top of the cake. Take the remaining frosting and add a small amount to the sides of the cake, scraping gently afterwards to reveal the layers. Smooth out the top and finish with the sugared cranberries. This past weekend was our annual Mother's Day trip with my mom and sister to Terrain at Styers, in Glenn Mills, Pennsylvania. I'm not exaggerating when I say that I look forward to this trip for months. A visit to Terrain always leaves me feeling refreshed and more importantly, incredibly inspired. Founded in 2008, Terrain is known for curating amazing goods for home and garden, seamlessly blending indoors and out. The store we visited has a full nursery of garden and house plants, home goods, a Garden Cafe as well as an event space. I've been known to spend HOURS just taking in everything that Terrain has to offer from smelling each candle to flipping through each book. It's an easy place to get a little bit lost with displays that transport you from the ordinary to the extraordinary. When we visit, we always take the time to have lunch at the Garden Cafe. The Cafe is BYOB and features locally sourced food that changes seasonally. With gorgeous plants hiding in every corner, and even suspended from the ceiling, eating at the Cafe is like finding yourself in a secret garden. Here's just a little bit of what I found inspiring on this particular visit. To see more of what Terrain has to offer you can follow them on Instagram but, if you can make a trip to one of the two stores to find your own inspiration, you won't regret it. Please note that I am in no way associated with Terrain, nor was I compensated for this post. All opinions expressed here are my own. All photos are property of The Forest Fern, LLC and were taken by myself. Oh fiddle leaf fig, how I love you! I was giddy when I finally located my fiddle at my local nursery. Yep, I was that crazy lady with two toddlers trying to get a giant tree into her car. The kids promptly named our new friend "Figgy" and you've probably spotted him in many of my photos and posts. I knew right away that Figgy needed to be repotted. His roots were pushing through the top of the soil and when I watered him, the water just rushed out of the drainage holes in the grow pot. We found Figgy a new larger pot at Ollie's Bargain Outlet. Seriously, Ollie's has some pretty fantastic pots at amazing prices. You don't want to pick a pot that is significantly larger than the current grow pot. A few inches larger will do the job. We picked a pretty blue and green terracotta number and paid $23. The first thing that I did to get ready to repot was to mix up my potting mix. This is something that I learned after having many house plants suffer from over-or-under-watering problems. Most commercial potting soils are just too heavy for house plants and they don't do a great job at letting water drain away or letting roots breathe. I started to make my own potting mix by combining 1/3 organic potting mix, 1/3 vermiculite and 1/3 perlite. My plants are so, so much happier since I started to do this! For a big job like this one, I like to make my mix in a big plastic container. I find that I am always either repotting a current plant or adding a new plant to my home so it's great to have a bunch of potting mix ready to go. After you have your mix ready, you can add that mix to your new pot. Add enough mix so that the top of the root ball of your fig will sit even with the top of your pot. I was lucky enough to have a small helper for this job. Now it's time to gently remove your fig from the current pot. I like to do this by squeezing in the sides of the grow pot until the root ball gently slides out of the pot when it is tipped on the side. As predicted, my poor Figgy was terribly root bound. I decided to do some root pruning. The trick here is to remove no more than 20% of the root structure. I used an old knife to gently remove just the outside layer of roots all around the root ball. Next, we picked up Figgy by the bottom of the root ball and moved him into his new home. Use your potting mix to fill in around the sides of the root ball using your fingers to gently push the soil into any air pockets. I also like to water as I go here to ensure that the soil is nice and damp (not wet!). When everything is filled in, give your happy plant a good watering. Keep your newly repotted friend out of direct sunlight and you may need to water a bit more frequently at first. You will also probably notice that you fig is looking mighty perky - mine sure does! Hey there Figgy, aren't you looking lovely!